The legal standard for gluten-free food in the United States is for the food to contain "less than 20 parts per million of gluten." Foods that meet this legal standard contain less than 0.002% gluten. You've almost certainly seen references to "parts per million" on various gluten-free products. Statements on product labels might say something like: "This product contains less than 20 parts per million of gluten," or "Tested to contain less than 5 parts per million of gluten." But what does this mean in terms of how much gluten the products actually contain? Bear with me, as this actually gets fairly complicated. The term "parts per million" measures the percentage of one substance as a part of another substance. For example, if a huge barrel of marbles contains, say, one million marbles, including 999,999 plain white marbles and one sparkly red marble, then that barrel contains one part per million red marbles. You also can describe that as 0.0001% red sparkly marbles. If that same barrel contained 990,000 plain white marbles and 10,000 red sparkly marbles, then it would contain 10,000 parts per million, or 1% red marbles. Now, when you're talking about parts per million (or percentages), the size of the barrel doesn't matter as long as the ratio of plain white marbles to sparkly red marbles stays the same. Now, you may not realize that most "gluten-free"-labeled commercial food products still contain a tiny bit of gluten, although some contain less than others. Foods that contain 1 part per million of gluten contain 0.0001% gluten as a percentage of the food, while foods that contain 20 parts per million of gluten contain 0.002% gluten. Everyone's body reacts to gluten in a slightly different way, and some people are just naturally more sensitive to trace gluten than others. While some people with celiac disease or non-celiac gluten sensitivity may do just fine with foods that test right at the legal limit (less than 20 parts per million of gluten), others will react to far lower levels. Obviously, the more foods you eat that contain a tiny bit of gluten, the more gluten you're consuming overall (remember, parts per million is a percentage, not a fixed quantity). If you're careful to choose foods with lower parts per million numbers, you'll be getting less gluten overall: one pound of something with 20 parts per million contains twice as much gluten as one pound of something with 10 parts per million of gluten. The bottom line is, lower is better when it comes to parts per million. How Much Gluten Did You Eat Today? According to the University of Maryland, people who eat a "standard" gluten-free diet with plenty of gluten-free grain products consume about half a kilogram (a little more than one pound) of gluten-free-labeled grain products a day (those servings of gluten-free cereal, pizza and bread can add up). Since those gluten-free-labeled grain products most likely contain between 10 and 20 parts per million of gluten each, someone who consumes that much "gluten-free"-labeled food per day actually is consuming a total of between 5 and 10mg per day of gluten. Some manufacturers of gluten-free products are more diligent than others in making sure their products go well beyond the legal standard of less than 20 parts per million of gluten. For a guide to manufacturers' parts per million testing limits, check out How Much Gluten Does Your 'Gluten-Free' Food Contain? Manufacturers that label their products "gluten-free" tend to be good at meeting the legal standard for those gluten-free foods. 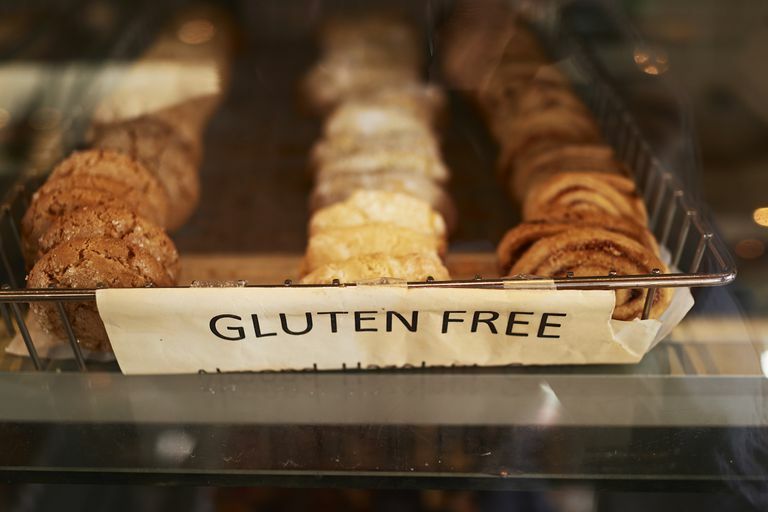 Foods that are certified gluten-free have to meet more stringent standards. For example, foods certified by the Gluten-Free Certification Organization must contain less than 10 parts per million of gluten, half as much gluten as the legal standard. However, if you're someone who seems to be much more sensitive than average (for example, if you have trouble eating at restaurants without getting sick, even if you're ordering off a gluten-free menu), you may need to stick with mainly unprocessed foods like plain meats and vegetables, seasoned with fresh herbs or gluten-free spices. Some people who are extremely sensitive to trace gluten have had luck ridding themselves of gluten symptoms by eating that type of unprocessed foods diet. University of Maryland. How Much Gluten Is Safe For Me? Press release, Aug. 4, 2011. Is Omission Beer Really Safe on the Gluten-Free Diet? How Much Gluten Does Your 'Gluten-Free Food' Contain? Which Bottled Iced Tea Brands Are Gluten-Free?